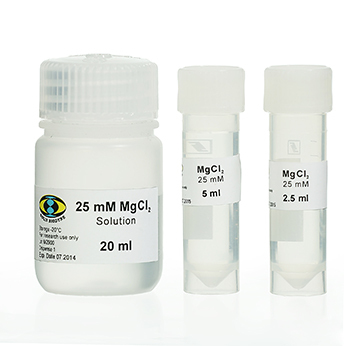 25 mM MgCl2 is used for adjustment of the Mg2+ concentration in the PCR reaction. 05-11-00025 2.5 ml 25 mM PDF PDF PDF 5 EUR Login to buy! 05-11-00050 5 ml 25 mM PDF PDF PDF 9 EUR Login to buy! Routine storage: -20ºC. Shipping at room temperature has no detrimental effects on the quality of this reagent.